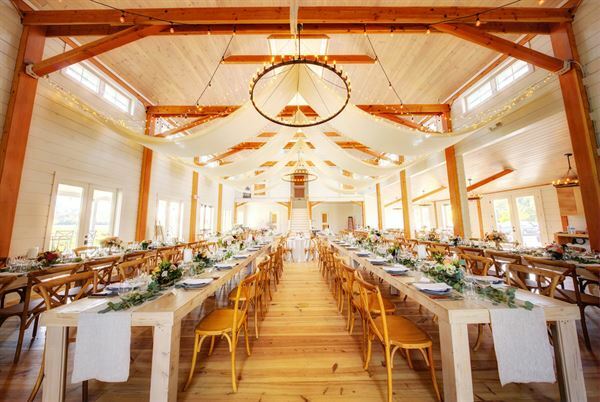 The Barn at Smugglers' Notch is Vermont's Newest Wedding and Event Venue and one Vermont's Most Beautiful Wedding and Event Venues! The Barn is set on the 77 acre historic Dodge Farm on the Mountain Road, minutes from the Smugglers' Notch and Stowe Mountain Resorts. With almost 360 degree mountain views, the location is one of the most stunning panoramic vistas in Vermont and New England. The Barn has plenty of windows to take full advantage of the unobstructed views of Vermont's tallest mountain, Mt. Mansfield, Smugglers' Notch and the peaks of the Green Mountains. Inside, The Barn was built with many unique design elements and has all of the comforts required for a successful wedding or event, including a full commercial kitchen, year-round climate control, luxurious bridal suite with elegant tile and glass rain water shower and marble counters, wood floors through out the barn (great for dancing! ), four upscale bathrooms, large built-in bar made from large timbers, awesome house music system ( inside and out ), tons of natural light and many levels of supplemental lighting. Another design element that truly sets us apart is the use of natural light. Our venue is full of windows, doors and skylights allowing you to bask in the beauty of the natural light while taking in the views of our natural surroundings. Service is something that we take great pride in. Our goal is to provide you with a seamless, stress-free experience. To that end, we have assembled a great team to provide you with outstanding service and a most memorable event. We put our all into your special day to create memories that will last a lifetime. A truly special place to have any type of event. Nestled in the foothills of the Green Mountains in Vermont, this former summer camp offers indoor and outdoor space for gatherings of 10 to 100, and comfortable, year-round accommodation for up to 30 people, and more in the summer months.